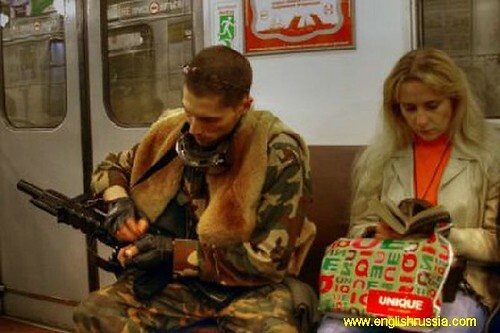 A soldier cleaning his gun on the subway with the woman next to him not remotely interested. Interesting subway sleeper - certainly not the most comfortable headwear to sleep in. 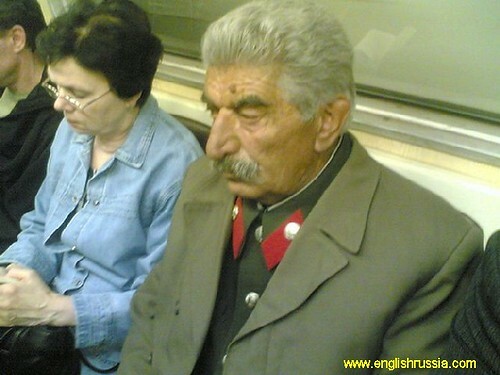 What looks like Joseph Stalin on the subway! Check out the the whole blog entry - loads more pictures and as the blogger says "There are plenty of other interesting people that you would be able to meet if you decide someday to travel to Russia". Just remember if you used any public transport to get around today that it's the best in the world. 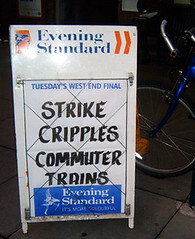 Forget about yesterday's strike which "crippled" South West Trains, that was just a blip. 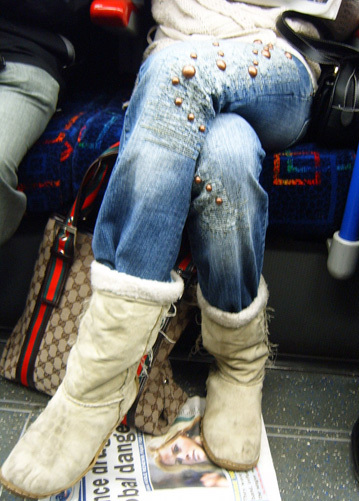 If you travelled under someone's armpit this morning, don't worry, that was just being cosy. If you stood for half an hour waiting for a bus and then three turned up at once, just laugh along with fellow queuees, and say "Don't you just love having the best transport system in the world?". 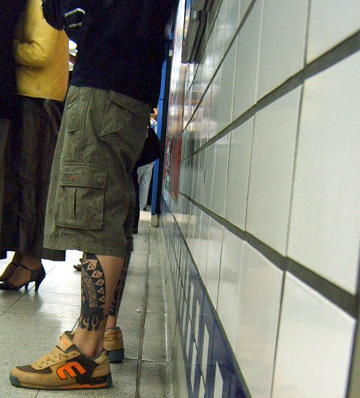 If you travelled on the Northern Line. Erm, well, erm. Oh just ignore this next bit. TripAdvisor (with emphasis on the trip - what were they on?) carried out an international survey where they questioned 2,000 people and 25 per cent believed that London had the best public transport in the world. New York was second, Paris was third and Los Angelos came bottom. But how many cities' public transport system had each person used for London to be top? I have travelled on the subway in Paris, Mexico, Lisbon and Toronto and as much as I like the Tube I'd say they were all a good deal more efficient than London. Perhaps it's a case of the grass always being greener on the other side. Admittedly I've never commuted on a daily basis in any of those cities (although I have travelled on all of them in the rush hour), so perhaps commuting is like a marriage or a relationship in that you really have to live with something day in, and day out before you can either appreciate its little quirks or rush off to marriage guidance. If the majority of people questioned were holiday makers, perhaps like me, they just remember the good things about travelling in London. City travel while on holiday is like having an affair or a holiday romance. You probably even see the delays and over crowding as exciting or charming ('Guess what', you can say at dinner parties in Australia, 'We were stuck on the Tube for two hours - how we laughed'). It's sort of fun because you haven't got to put up with it all the time. "Two in five said the most important quality of a transportation system was that it went everywhere they needed to go, which was considered even more important than safety (30 per cent), proximity (16 per cent), frequency (5.5 per cent), cost (4 per cent), cleanliness (1 per cent) and comfort (0.8 per cent)." So I'll grudingly accept that you can get more or less anywhere in London by public transport - although it's interesting to see that speed of getting there didn't figure as part of the equation. Also the respondents weren't completely deluded. No matter how much TfL try to spin that we have great value travel in London, we don't - and that's official. "London's public transport services get a lot of bad press but it seems that the international travelling community think it's the tops all round, even taking into account that it is also thought to be the most expensive" said Michele Perry from Trip Advisor. Enough of my ramblings, what do you think? Does London deserve it's honour of having the best public transport in the world? If not, which city would you have voted for? Is there nothing that Ken Livingstone won't do to flog Oystercards? Dmitri sent me a link from the BBC's site showing that from March next year if you live in India, Hong Kong, Singapore, Spain, Portugal and the USA, you'll be able to travel "smarter, faster & cheaper" with Oyster. However our Sheriff wasn't quite as positive as the glowing research above "The best way for visitors to travel around the capital is usually by public transport" he said. "Usually" by public transport? C'mon Ken, you know nothing, we've the best public transport system in the world, there's no usually about it. But hey-ho at least having an Oystercard might mean a faster route through the barriers themselves. It's quite galling being behind anyone who 's not got fast ticket or Oystercard swiping action at the gates. I've seen a number of tourists try to put their credit cards through the travelcard slot, or waving their credit cards over the Oystercard reader and expecting their cards to be magically debited. Perhaps those days may be coming to an end. This content could "challenge or offend"
I usually still find it difficult to talk about something that I just end up doing. I'm still surprised I'm doing it three years down the line. I'm still surprised that millions of other people do it too. I find it pleasantly surprising there's even more and more blooks (blogs based on books) selling very well in the shops. Both Random Tom Reynolds' (who appears later in the series) and Girl with a One Track Mind's books seem to be selling like hot cakes and the great thing is that they're both still blogging. 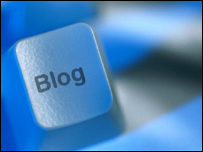 Anyway, Radio 4 listeners have been warned that the links that follow to the blogs contain content that "could challenge or offend". I wouldn't think that mine comes remotely within that description, unless you're the PR department of London Underground. 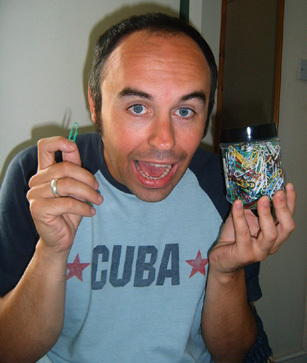 Cheers to Mark Savage for letting me rabbit on and I'm looking forward to hearing the results even though I'm sorry they didn't keep the original title of "The Mouse That Roared"
Lots of entries to the 2nd cryptic quiz - so Neil had paperclips galore to choose from. Also the first time I believe a family entered the quiz - so very well done to them! I feel like Bruce Forsyth (Gen Game) or Les Dennis in Family Fortunes. There were also some very good cryptic clues to Barkingside including Neil's very ingenious "Paddington goes round vicious monarch" which my Neil had to explain to me (yet another Neil to join the many Ians and Petes and Alans....and Gommons!). Jamesthegill's "Outside of a tree is not outside" and Alantan's "A place to put your drinks on half of a chess board." However, the lucky paperclip winner is Rosie - who'll win a copy of Underground London. Well, done Rosie! Good game, good game, points make prizes, nice to see you to see you nice, didn't they do well, etc etc! 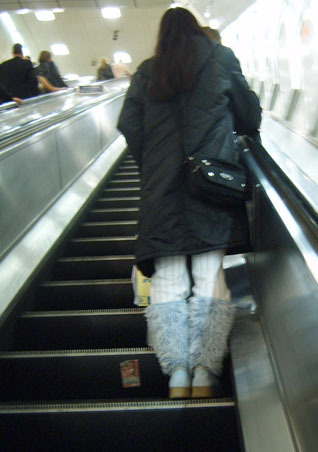 It's the second week to vote for your favourite London Underground fashion victims from the dozens featured over the year (shame there's only current 177 currently as does that technically count as hundreds? Probably not). It's been pretty hard to go through all of the women and limit to six as there are so many horrors. But once again you have a chance to agree, select one or nominate another for Ms TFV 2006? Tell us who's your personal favourite & why? Or come up with a caption for your favourite? It might be what Ms TFV was thinking when she looked in the mirror? 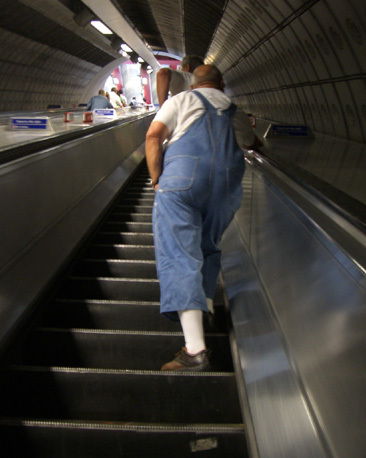 There will be a some suitable London Underground "clothing" for the best captions and if you select the man or woman who get the most nominations you'll go into Neil's paperclip selection to win a 2007 Calendar featuring the finalists. You have until 23.59 GMT on September 3rd to enter your nominations. Have fun! Christ knows who voted for it! 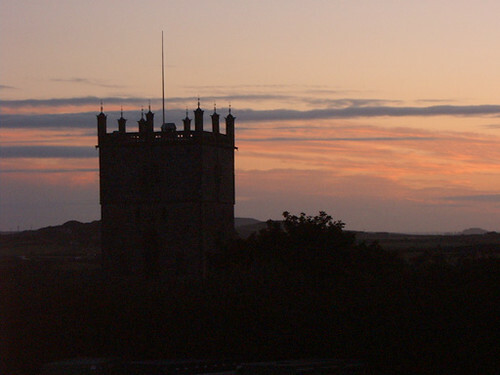 St David's is the smallest city in the UK. If you want to see the others, mine are here and Neil's here! Going to Notting Hill Carnival? I heard on the radio earlier today that there are going to be "airport style" metal detectors on the London Underground this weekend to try to crack down on the expected crime levels at the Notting Hill Carnival. 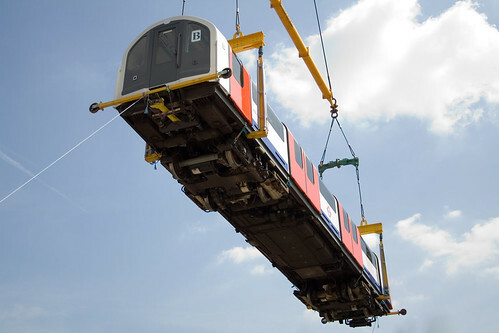 So I imagine that this will make the Tube even more congested than normal. Nipping over to TfL's website to try to find out more about this, I was faced with the powers that be in publicity struggling with the quandrary of what to say about the carnival. "You'll have a fun time with friends", but "Don't meet them outside a Tube station"
"The easiest way to travel there & back is by bus or Tube" v "Walking is sometimes quicker and easier"
"You'll have a brilliant time" but "Think about your return journey before you even get there". "It's great, go there" v "Don't use the Tube". I haven't been to the Notting Hill Carnival for years, but when I last went, like thousands of other people, I used the Tube. Even though I live in West London I never considered that "walking is sometimes quicker and easier". To me it was part of the fun to get on to a fit to bursting Hammermsith & City Line train & walk from Westbourne Park. Any tips on "quicker & easier" routes? Oh and remember, if you go and see the metal detectors, try not to comment on their effectiveness as you might find yourself hauled over by the police. I particularly like the way that no one seems particularly interested in them, as though you see people on playing board games on the Tube every day. But perhaps you do? In all my years of Tube travel I can't say I've seen anyone playing board games. Loads of Sudoku, crosswords, word search, which are all understandable and usually fairly solitary pursuits and it's pretty easy to pack away a paper easily. I can only guess that they were in the middle of 12 hour backgammon championship game that simply couldn't be stopped. Have you seen any unusual games being played on the Tube (tonsil tennis doesn't count)? Or any games that you think are under utilised in Tube travel? 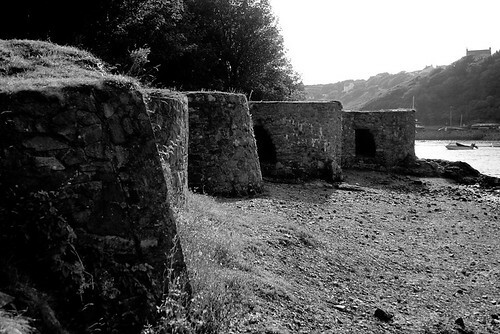 Me and Neil are taking a mini break to St David's on the Pembrokeshire coast. 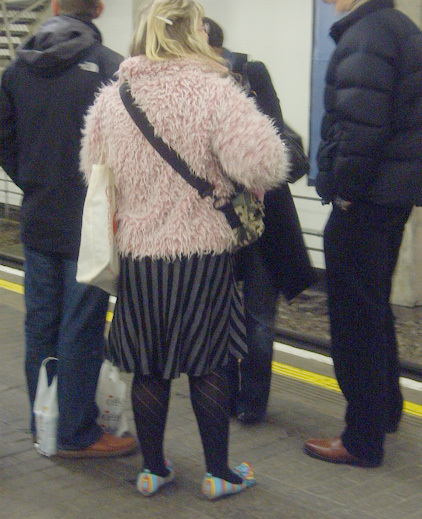 It's been suggested that I get people to vote for their favourite London Underground fashion victims from the many featured over the year. Trawling through the current 177, I've picked some of my favourite men and women as contenders for the overall title. But do you agree with them or do you have another that you think should be Mr or Ms TFV 2006? Tell us who's your personal favourite & why? Or come up with a caption for your favourite? 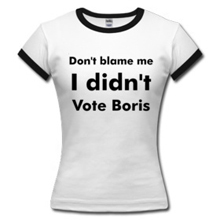 It might be what Mr TFV was thinking when he looked in the mirror? "He reported it to his controller and proceeded at caution. Ahead of him were green signals and no points, but he was sacked without mercy because he didn't follow procedure exactly,"
Well that makes him sound like a pussycat in comparison to the water throwing Northern Line Driver whose SPAD led to some wildcat strikes earlier this year. Canary Wharf station staff will also be balloted after claims of harrassment of union representatives and discrimination against gay workers. Bob Crow said "A female member of staff who was sexually assaulted on the barrier has suffered constant harassment from local management since. "A gay member of staff has suffered homophobic remarks, and there is a widespread view that gay staff members are routinely discriminated against." "London Underground has a strong policy against harassment of any kind and takes such matters extremely seriously. "In this case, the RMT's claims have already been subject to formal investigation and were not founded. 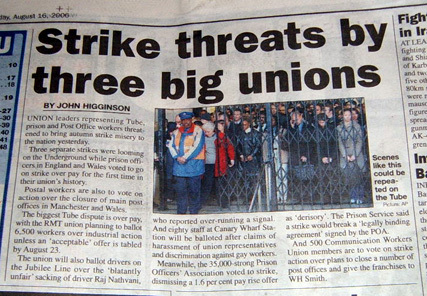 If there are further issues then balloting for strike action as a first step is not the way to resolve any issue." It will be pretty interesting to see how the latter pans out, particularly as some of Bob Crow's crownies didn't appear to have the most PC of attitudes to female bar staff when they were banned from a pub in January. Good to see the RMT have seen their error of their ways and are now deciding to take a stand against sexual harrassment. When Tube carriages finally give up the ghost they are normally turned into scrap metal and landfill (that's after trendy designers get hold of the upholstery and make expensive dog coats), however it looks like there may be another use for them. Old Jubilee Line carriages are going to be made into work spaces for creative start-up businesses in Shoreditch, East London. 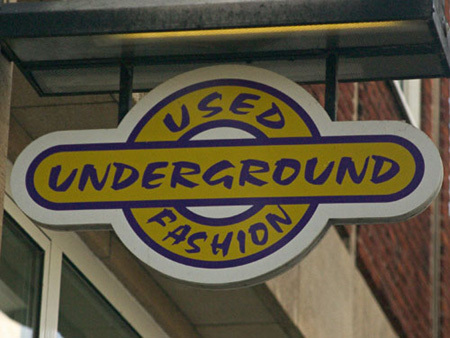 The project is the brainchild of Village Underground, a new charity which supports new small companies. "The idea came from my own experience as a designer trying to start a small practice with friends – we just couldn't get a foot on the ladder because of the price of studio and workspace......so I designed my own." I personally couldn't really see myself spending my entire working day in a Tube carriage though, as I'd feel a bit cramped after a while. Doubtless, I'll make a trip over to Great Eastern Street at some point to see what they look like in-situ. Thanks to Marc for the heads-up on this. 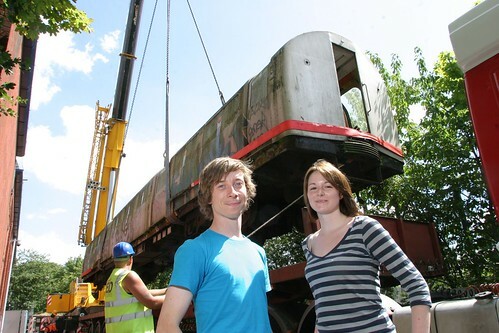 Julie Pottinger from Tube Lines is all for the re-cycling and is keen to hear of other ideas for defunct carriages. "It's great that we can put these old carriages to good use, benefiting local people and saving the environment a little. We're keen to find more ways of avoiding waste so if other people or organisations have ideas, we'd love to hear from them." Quite some time ago Metro published a story about former London Underground worker Roger Brown who had an old Tube carriage in his back garden - presumably quite a large back garden - and he seems to use it just to sit around and read papers, like blokes tend to do in allotment sheds. "Some people think I'm bonkers", he mused "and I probably am. But I love trains and it's great to have one in my own garden". I'd quite like the idea of seeing old carriages used as mini restaurants or cafes. They'd probably also make a good play area for kids who could bounce up and down on the seats as much as they liked with no scowls from fellow commuters. They could also have a ball swinging round the poles and hanging from the strap hangers and practicing their graffiti skills on the outside. 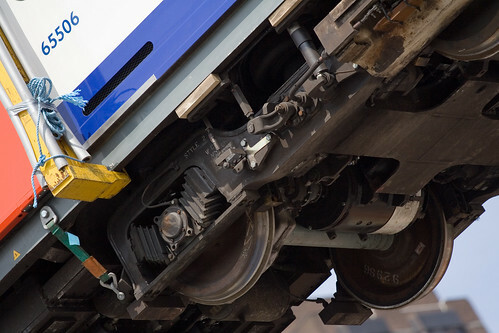 Do you have any more suggestions for re-cycling Tube carriages? Or do you have room for one in your back garden? I don't if my Piccadilly Line Tube driver the other day used to be an air stewardess or cabin crew or whatever they are called at the moment, but she was one of the most cheerful and well spoken drivers I've ever heard. With each stop she would very politely announce the station names with introductions such as "If you've been waiting patiently for the Bakerloo line, your wait is over as you can change at Piccadilly Circus for the Bakerloo Line". 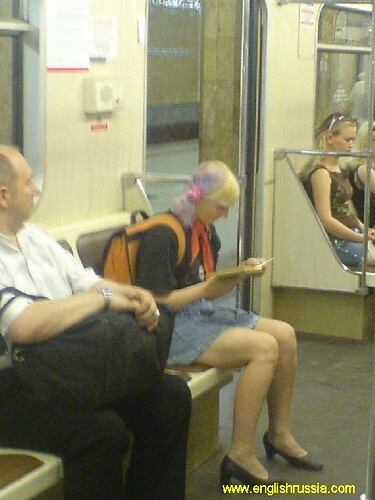 It took lots of people on the train by surprise, but in a very pleasant way. 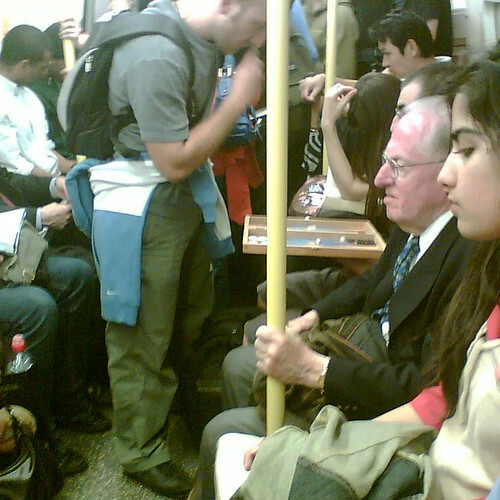 Do you ever come across any unusual Tube drivers on your journey - whether unusually cheerful or unusually miserable? 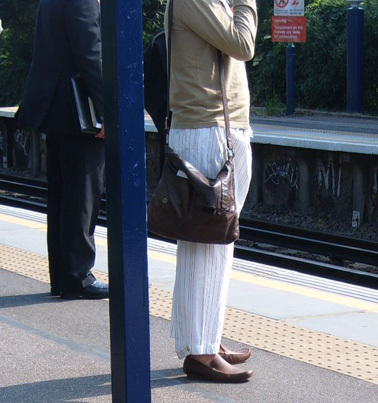 Do you think they all should take some happiness lessons like this woman, or should they reflect the general mood of the commuters? You must give a different answer to the people before you, so get in quickly as the easier ones will go first! One guess only please, plus there's a bonus point for coming up with a cryptic clue to Barkingside! To enter leave your email address and/or blog/website with your answers in the comments below. Please leave both your answers in one entry and you can only enter once! You have until 23.59 GMT, Sunday 20th August to enter. Everyone with two points will go into the paperclip selection. Number 5 stumped everyone, so everyone with 4 points went into Neil's paperclip selection and the winner was Marc who will be the lucky owner of Ben Apps's 1954 Tube map and a nostalgic fridge magnet! So the winner of this week's quiz will get a copy of the really fascinating book Underground London by the travel writer Stephen Smith. He provides an alternative guide and history of London, and takes us on a journey through the passages and tunnels of the city, the bunkers and tunnels, crypts and shadows. Obviously the Tube features heavily as Smith gets a special guided tour by a London Underground night worker wth a private viewing of the "ghost" station King William Street. Here's Friday's regular look at our slaves to fashion or following trends on the Tube or people with a particular style that they've made their own. I'm really sorry in that I couldn't find any public transport Californian fashion victims (plenty on the streets mind you - but no one on the trains and street cars I travelled in). The glitter bags seem to be multiplying here. Perhaps a mischevious five year old or a Tube Elf has been running through the Underground with some Copydex glue and several pots of pink glitter. 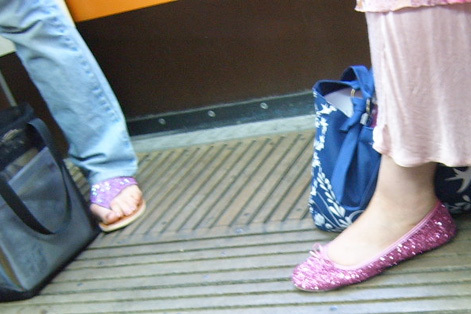 Where have all these pink glittery things come from while I was away? I took this picture yesterday. It wasn't very cold was it? So why the need for tights? And do fishnet tights keep you warm? The mind boggles, it truly does. I've seen worse displays of labels, and at least this one showed some imagination with all the letters from Versace scattered across his T-Shirt in various fonts and sizes. All right, all right, as so many of you are asking (well two of you), the Northern Line signal failures were actually predicted yesterday, so don't say you weren't warned! According to AFX news "LU said the system breakdown at Clapham Common forced it to impose a limited service between Stockwell and Morden. It said maintenance contractor Tube Lines were working on the problem and passengers should avoid Stockwell station and use overground services instead." But just in case you think their prediction of delays is a sign that they are getting their act together, fear not. 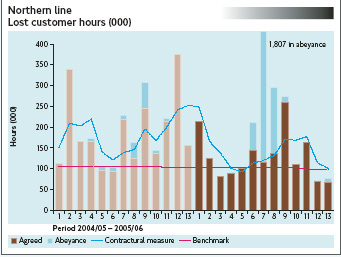 The 'misery line' recorded more than 5,000 delays between May 2005 and May 2006, confirming its status as the worst-performing line for the 100,000 passengers who use the service daily." Looking on the bright side a cheery spokeswoman from Tube Lines spun "Whilst we acknowledge the need to improve performance faster on the Northern line, year-on-year service reliability has improved by 30 per cent and the number of incidents has dropped by 16 per cent since 2003 when Tube Lines took over,"
"The Northern Line is the most heavily loaded line on the Underground in terms of passenger numbers and has some of the oldest assets but performance is getting better and we are committed to improving the performance of the line to the standards we have achieved on the Piccadilly and Jubilee lines." Mmm try telling that to some people who had three hours of delays last night. I think London Underground's solictors ought to get their passports at the ready to track down this collection of London Underground roundels, not seen on the London Underground. From Albuquerque to Vancouver, you've been sending in pictures from around the world. Ian was collecting roundels in Germany while he was over for the World Cup (although his much nicer World Cup pictures can be found here). My favourite I don't think would have TfL's legal bods chomping on the bit too much with a rather cartoonish version of the logo from Munster. I almost expected it to say Oldie English Music. 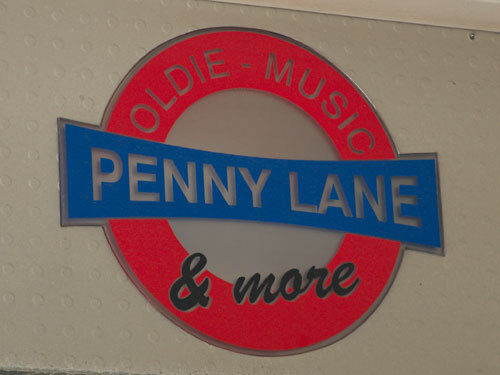 But Penny Lane as far as I know is in Liverpool - well at least the Penny Lane in the song is. 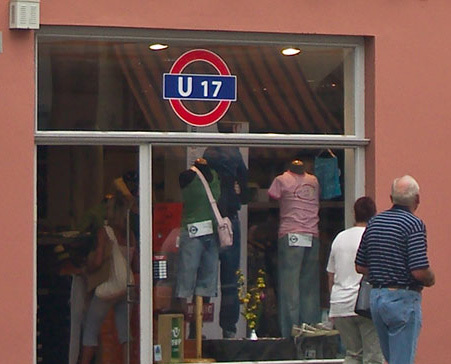 Unless there's another Penny Lane in Dortmund. 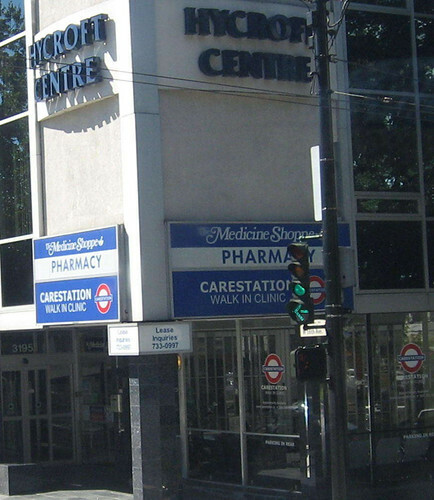 Ross Younger who's currently working in Vancouver spotted "the so called Carestation" from a bus. I know how difficult pictures when you're moving, as I spotted on while I was on a train in California, but couldn't get my camera out in time. Not sure how wild I'd feel about going to a walk-in-clinic with the Tube logo on it! 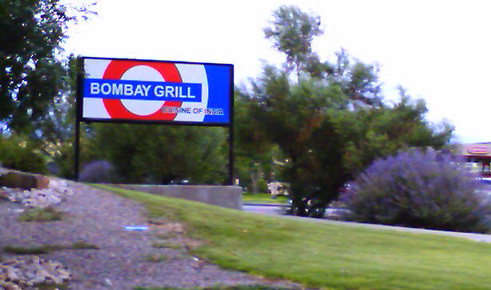 Finally, I think the furthest away from London, is Tina Threadgill's "Bombay Grill" Indian Restaurant in Albuquerque, New Mexico. 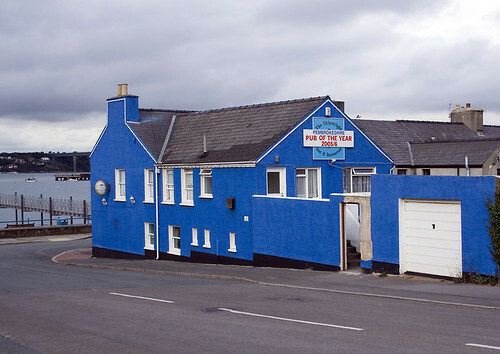 One can only imagine that the owners were from London. Many, many thanks to you all for sending these in. If anyone else has ones to add to the ever growing collection please email me. Well it looks like the end is almost in sight. Eagle eyed version-3-point-one spotted the refurbished trains being carried from their make-over in Doncaster back to their rightful homes in London. 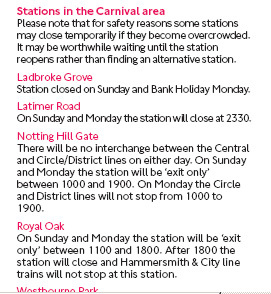 So does this look as though the Waterloo & City Line will be on time for its re-opening in early September. Version-3-point-one says "The work will be continuing next weekend, so if you want to catch some flying trains, make sure you don't miss them. 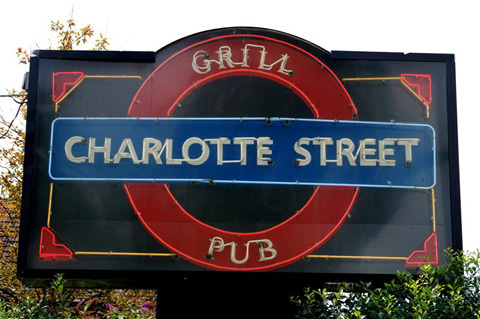 Take the Jubilee Line exit out of Waterloo station and turn right out - Lower Marsh is signposted." The rest of her set of pictures can be seen here. And that shot just above is the closest I want to get to seeing the underside or "belly of the beast" as she so nicely puts it. Does anyone want to place bets on when it will actually open though? TfL are still hedging their bets with "early September". Metronet were being superbly optimistic by saying 1st September. whereas Wikipedia have plumped for the 4th September. Which will it be? Back in London and looks like the heatwave is still on after a break in the temperatures while I was away. Many thanks to Ian for spotting a story about "conceptual artist" Liam Yeates late last week. He said "About a year ago I was getting fed up with travelling on the Tube and being hemmed in with someone's armpit in my face. 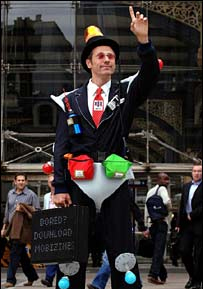 I developed a suit to keep people away and get round the problems of travelling on the Tube." There's an electric fan disguised as a briefcase to keep cool, but also other "Inspector Gadget" like items include some novel "seat savers" designed to ensure other passenger stay or at least don't use the seat next to him. These include the charming fake turd and a spoon dripping with plastic 'yoghurt'. Mr Yeates claims to have received some positive reaction tot he suit after appearing on the DLR and the District Line last week. However a puzzled passer by said "Is he meant to be a superhero? Or has John Major influenced him? He used to wear grey pants over his trousers." Yeates believes his suit is conceptual art, yet he's actually sponsored by Mobizines who carried out a survey to try to find ten commuter commandments (they produce magazines that can be downloaded onto mobile devices presumably a way to deal with a boring commute). One of the commandements definitely seem to echo Yeates' wish to keep well away from fellow Tube passengers - "Thou shalt never speak to fellow commuters unless completely necessary". 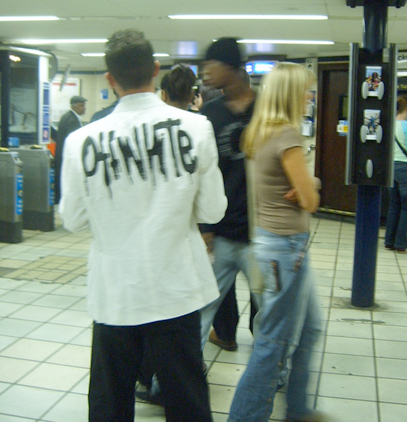 However, Yeates in convinced his suit is more than just a commercial gimick to remind people about commuter crush (as if we need reminding) "People who get p***ed off with conceptual art feel that because they don't understand it or they aren't involved in it. Most people don't understand conceptual art but it is still valid." But is it really art or just a commercial gimmick? Would you engage Mr Yeates on the Tube with a conversation about how Hell is other people, or do you just think he's a bit of a nutter who raided a joke shop? 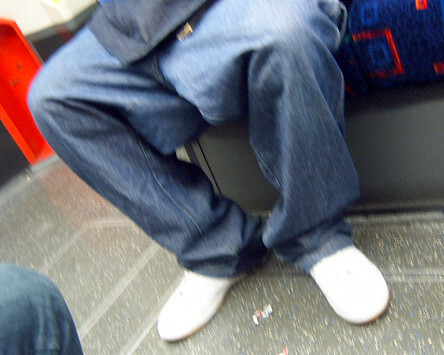 If his suits seems a bit over the top, do you have any other personal tips on keeping your own bit of personal space on the Tube? Share them, please, as it looks like being another hot week. Sorry to a be a bit tardy with the results of this quiz where Tube station names can form the basis of Cockney Rhyming Slang. There were some great new ones of your own but I managed to stump you with how I devised "I don't give a Pinner". I also liked Alan P's seasonal "My advice for this hot weather is to put a few beers in your Upminster Bridge (fridge) and sit in the garden until you are nice and Acton Town (brown)." However no one managed to get the full maximum point score so all eligible names went into Neil's paperclip selector and the winner is the aptly named yaay! 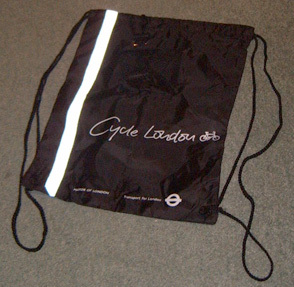 So yaay wins Fimb's prize of the Cycle London bag and Alan P and Michael get something from my Tube goody bag. Oh and "I don't give a Pinner" - it's obviously from "I don't give a toss" or rather "I don't give a moss" - Moss Lane - Moss Lane is a street in Pinner where incidentally Faye Tozer (which also sounds a bit like toss) is from. I'm amazed that none of you got it! In 1914 Professor Archibold Montgomery Lowe, writing for Trains, Omninbuses and Trams predicted the following for the Tube. "In 1999 every station will have comfortable waiting rooms, and with all the trains, the news of the moment and perhaps a picture of the moment thrown on artistically illuminated screens" Well he's not there with the comfortable waiting rooms, but his prediction the illuminated poster screens is looking like becoming a reality. TfL reported yesterday that Oxford Circus, Bond Street, Victoria, Kings Cross, Piccadilly Circus and Tottenham Court Road Tube stations are likely to be among the first on the network to be installed with new digital advertising screens. "The new technology is part of an investment programme by Viacom Outdoor and will involve more than 31,000 non-digital ad sites being replaced with new slim-line poster frames. New Cross-Track Projection technology will see moving ads featured at 24 stations. 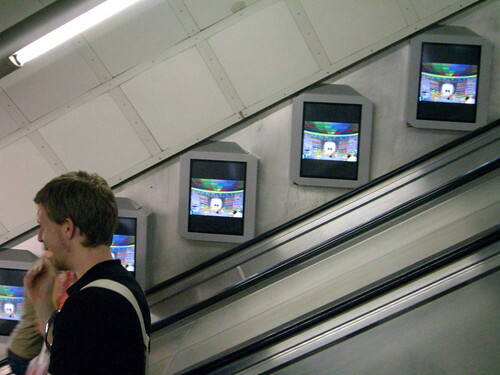 Designed to create a gallery of advertising at ticket halls, passageways and station platforms, the screens will transform passenger journeys with fast-moving TV-style advertising." There was a segment on the "You and Yours" programme on Radio 4 a few weeks ago about advertising on the Tube. They talked about the LCD screens that you've may have seen on the Tottenham Court Road escaltors (which actually make me feel a bit dizzy) and apparently those trials have been successful. A regular commenter had kindly recorded a snippet of this and downloaded into an MP3 which can be found here. As much as I like ads, I'm personally not sure I want to see TV ads on Tube and it's interesting that the guy from Viacom thinks these are a great because they "talk to you and entice the user to look and stay and watch". I don't think I would find any ad so compelling that I would want to stay around and miss my train to watch it. 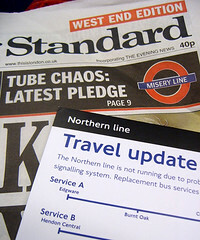 However he also says that the ad spaces can be used to provide news items or film updates from the Tube themselves. I'm assuming there will be no sound on these ads as you'd be driven mad otherwise. What do you think? Will you find them more compelling? Do you think that advertisers are going to be flocking to spend money on them? What sort of ads do you think could work well on them - if any? Does Sonya get on yer nerves? A reporter from the Washington Post got in touch with me to say that the Metro in Washington appointed Randi Miller "record peppier messages warning customers to stand clear of doors or move to the center of trains". However, Miller is worried there will be a backlash to her continually repeated messages. Initially, she thought it would only be used when someone was blocking the door and she had no idea that the message would be continually repeated and thinks it is a bit excessive. Emma Clark who is the voice of the Victoria, Bakerloo and Central Line also gets a bit tired of hearing her voice but being Miss Mind the Gap had it's moments. In an brilliant interview with b3ta she said: "You should have heard the multiplicity of ways they made me say 'Marylebone.' Mahree-lee-bone. M'ree-labbon. Mary Lob-on. It was bleeding hilarious." She also admitted that there were some spoof recordings to pass the time "Me and the producer did record some spoof announcements after the LU suits had left the session, purely for our own amusement. Stuff like: 'The man in the green coat is sitting in tramp's piss.' And 'Passengers are reminded that reading 'Captain Corelli's f**king Mandolin' is strictly prohibited.' "
I know that a number of drivers on the District Line turn off Sonya's repetitive messages announcing the next station or the current station, mainly because it lives up to the name and Gets on yer nerves. But should they really be doing this? What about poor old tourists who don't know where they are going? The reporter had also asked me whether I thought that voices should reflect the lines, which is an idea I loved. I think a Victor Meldrew sounding voice would be perfect for the Northern Line. I believe that the London Underground once considered having celebrity voices as they do in the lifts at Covent Garden (as you probably know) they use Loyd Grossman whose loose mid-Atlantic vowels tell you to "Turn roight out of Covent Garden for my Favooooorite Museum - The London Transport Museum". I believe that Hugh Grant was also considered. Probably for Notting Hill - although that could be an urban myth! Aren't Joanna Lumley's dulcet tones also used somewhere on the Tube? It's weird that we seem to have lost The Shouty Man though - who doom laden "Big Brother" voice used to bellow "Mind The Gap". There still is a particularly terrifying and echoey "Mind the Gap" at Bank though - presumably because the gap is so big and perhaps a woman's voice wouldn't convey the seriousness of the consequences if you ignored their warning. What do you think of automated voices? Who's your favourite, or do you hate them all? Would you like to vote for them like the commuters in Washington? 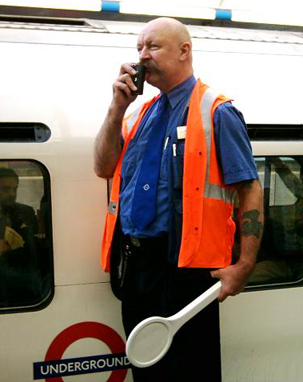 Do you think that the drivers or station assistants should make all announcements, as at least that keeps you reassured that the system is being operated by a real people?